A pane of glass from a wall on the Valley Performing Arts Center broke Saturday afternoon. The damage occurred during the first performance of “The Nutcracker” at around 1:45 p.m., said Mike Bergantzel, manager of facilities for the VPAC. Bergantzel said the cause for the breakage is unknown. “It just broke spontaneously,” he said. The broken window is from west side of the building, which is made almost entirely of glass. The entirety of a 5 by 6 square foot pane was damaged. A new window assembly will be ordered from the manufacturer and take three to four weeks to be ready, Bergantzel said. When the new glass arrives to the VPAC, it will take about a day to replace the old one, which sits about seven feet off the ground. The glass on the west wall of the VPAC is safety glass, which is similar to what it is found in cars, Bergantzel said. If the glass breaks, a plastic membrane keeps it from separating and falling to the ground. Bergantzel said the other glass panes on the VPAC were not in immediate danger. On the last play of the game with CSUN up by one, USC’s junior guard Ariya Crook dribbled into the lane and put up an airball. Junior forward Alexyz Vaioletama tried to tip it back in, but the ball rolled on the lip of the rim for what felt like hours before it popped out. The CSUN Matadors (3-7) escaped with a 65-64 win over the USC Trojans (5-4) Tuesday night. Junior guard Ashlee Guay led Northridge with 16 points, five rebounds and six assists while Sharpe had nine points and eight rebounds. Sophomore center Bernadette Fong had another strong outing off the bench, finishing with 10 points on 5-for-6 shooting. The Trojans had three players in double figures led by Vaioletama with 21 points and 18 reboundsand Cassie Harberts with 18 points and 12 boards. CSUN was up by five with a minute and half left in the game after Sharpe banked in a floater in the paint. But Crook made a layup and a 3-pointer to tie it at 64 with 32 seconds left. Then Vaioletama fouled Sharpe in the backcourt, sending her to the free-throw line because USC was in the penalty. Sharpe split the pair of free throws, giving the Matadors a one-point lead. On the next possession, USC turned the ball over, but CSUN kicked it out of bounds trying to retrieve it, which set up the final Trojan possession with 17 seconds to go. The game was close throughout with 10 ties and 13 lead changes. Neither team led by more than six for the entire contest. CSUN got off to a quick start, opening up a 9-3 lead with the help of two early USC turnovers. The Trojans got back into it with two back-to-back baskets, pulling them to within two. Crook tied the game at 17 with a free throw after receiving an outlet pass from a teammate and scoring a layup in transition while getting fouled. Later, freshman guard Emily Cole’s 3-pointer put the Matadors up 28-27, but Vaioletama answered back with a layup off a touch pass from Harberts, putting the Trojans up by one. Guay drained another CSUN shot from downtown, regaining the Northridge lead. Even though the Trojans shot a blistering 54.2 percent from the field while the Matadors only shot 43.8, Northridge came away with a 35-33 lead at the half. CSUN’s defense forced 17 USC turnovers while the Matadors committed only eight. “We wanted to try to make them play a little faster than they normally do or that they wanted to,” head coach Jason Flowers said of his team’s defensive game plan. Sharpe feels Tuesday’s win against a Pac-12 team with a winning record was a big step for the Matadors. 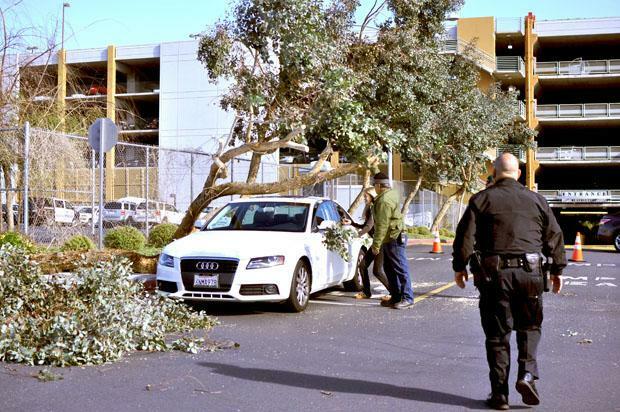 Rough winds blowing in from the northeast at more than 25 mph, according to the National Weather Service, caused a tree to topple onto a student’s car Monday afternoon in the B3 parking lot. 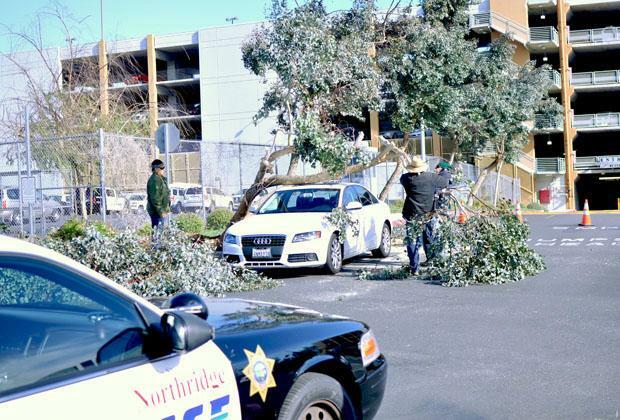 Kristyn Bockman, 23, senior communications major, was pulling up to a stop sign when a tree fell down onto the roof of her white Audi. Bockman was on exiting the parking lot heading towards the Darby Avenue exit when the incident occurred. Employees from the Physical Plant Management Facility Services cut away at the branches that were forced down by high winds. Campus police was soon on scene and directed traffic away from the incident. The car sustained minor damages including a dent and several scratches on the roof. However, it was still in driving condition. SAMOHI — The Santa Monica Vikings took fourth place in the Santa Monica Tournament with a 68-60 loss to the Fairfax Lions on Saturday night at home. Samohi sophomore guard Jonah Mathews led the way for the Vikings with a game-high 22 points while senior guard Victor Costa chipped in with 15 off the bench. Sophomore guard Antoine Monroe had 20 points to lead the Lions and senior guard Sage Woodruff added 17 points. Mathews dominated the first quarter, starting with a four-point play after getting fouled and draining a shot from downtown. Fairfax shot back with a 5-0 run to take the lead, but the frame was close throughout, ending in a 15-14 Lions lead. Mathews had 12 points in the opening quarter, but just 10 points the rest of the game. Fairfax came out in the second quarter with four straight points in less than a minute, forcing a Vikings timeout. The Lions extended their lead to 27-18 with a 12-4 run. But Samohi increased their defensive intensity, forcing turnovers and scoring as a result. Senior guard Chris Johnson’s free throw capped a 9-0 Vikings run to tie the game at 27. Fairfax answered Samohi’s spurt with two 3-pointers by Monroe and a bucket by sophomore forward/center Babacar Thiombane to end the half with a 35-31 advantage. The game remained contentious in the third. Mathews pulled the Vikings to within two with a 3-pointer, but was immediately answered by Woodruff’s shot from beyond the arc. On one Lions possession, Samohi was able to intercept a pass and ignite a fast break, but then turned the ball over, leading to a basket for Fairfax and a 43-36 deficit. “We played really hard together, but tonight, there were three or four possessions where we didn’t find our man or we didn’t rotate and those were buckets that (the Lions) got,” Mathews said. Samohi made some noise late in the quarter when senior guard Ray Mancini stole the ball and knocked down an elbow jumper to cut the Lion lead to just one. But Fairfax answered again, putting together a 6-0 run and ending the frame leading 52-45. The Vikings cut the deficit to three in the fourth after a pair of Costa free throws, but Fairfax ran off an 8-2 run punctuated by a vicious two-hand dunk by senior forward/center Oleesameeka Nwachee, sealing the victory. The Vikings stumbled in the face of pressure defense from the Lions all night, often having trouble getting the ball across mid court. Mathews feels that these last two losses can teach the team to be better in the future. Samohi is now 2-2 on the season. The Matadors (24-6) advanced to the second round of the NCAA championship in five sets with a 3-2 win against the Colorado State Rams (28-2) Thursday night, 25-15, 25-21, 13-25, 18-25, 15-12. Up four in the fifth set and one kill away from their first victory in this year’s NCAA tournament, CSUN gave up two straight points to Colorado State, forcing them to take a timeout. With the two teams back on the court, freshman outside hitter Michelle Lawrence got a set and spiked the ball right out of bounds, and the Matadors began to celebrate. Junior middle blocker Casey Hinger led the way for CSUN with 17 kills and 16 digs while senior setter Sydney Gedryn notched 51 assists on the night. 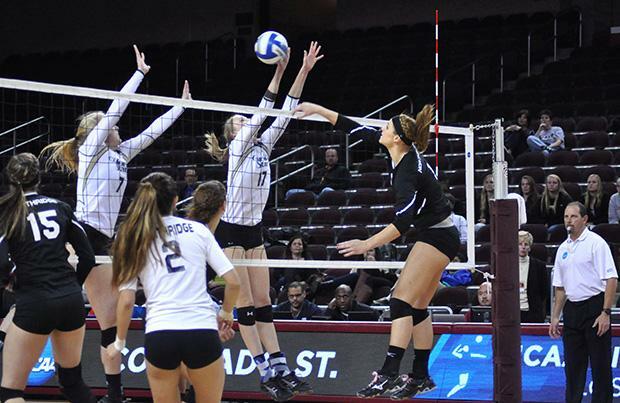 Colorado State’s sophomore outside hitter/setter Adrianna Culbert led the Rams with 17 kills of her own. The Matadors got behind early in the final set, giving up the first two points to the Rams. Sophomore middle blocker Cieana Stinson tied the game at four with a kill aimed toward the left side of the court. Colorado State then put together a string of three straight points and led 7-4, but CSUN tied the game again with some strong defense, digging all the attacks thrown their way by the Rams and scoring as a result. Junior outside hitter Marlee Reynolds committed two attack errors, leading to a 14-10 Northridge lead and eventually the victory. Head coach Jeff Stork was proud his team came away with a hard-fought win. Northridge looked strong to start the match, taking a 5-2 lead in the first set, but the Rams fought back and tied the game at five apiece. From there, the set would be contentious with the score being knotted seven times, but CSUN put together a 9-0 run and took the first set, 25-15. The second set also saw a lot of back and forth between the two teams, but Northridge was able to shoot off a 7-1 run with the game knotted at 14 to take a 21-15 lead. The Rams knocked on CSUN’s door and closed the gap to three, but Hinger’s kill put Colorado State away, 25-21. But after halftime, Colorado State roared back with the best hitting percentage of the match in the third set at 72.7 and won easily, 25-13. The fourth set was more tightly contested, but several of CSUN’s attacks were being hit out of bounds, granting the Rams easy points. The Matadors also couldn’t handle the improved defense by Colorado state and lost, 25-18. Stork felt Northridge going the distance and winning says a lot about the team’s resolve. The Matadors will play the USC Trojans in the second round of the tournament Friday at 7 p.m. in the Galen Center. The CSUN Matadors (5-4) dominated the Southern Utah Thunderbirds (1-5) 84-57 behind a strong performance by junior forward Stephen Maxwell Tuesday night. Maxwell reached a double-double in the first half and finished with 27 points and 13 rebounds for the game. Junior guard/forward Stephan Hicks had an efficient game, scoring 20 points on 6-7 shooting, and also reached the 1,000-point plateau in his CSUN career with his first two points of the contest. Freshman guard Trey Kennedy led Southern Utah with 17 points and three assists. Maxwell started the game with CSUN’s first 10 points as the Matadors took an early 10-7 lead, but a 5-2 run by the Thunderbirds knotted the game at 12 apiece. With the game tied, a Maxwell layup started a 10-2 run punctuated by freshman guard Aaron Parks diving for a loose ball which led to a Hicks 3-pointer to push the Northridge lead to eight. The Matadors extended the run to 22-6 after junior forward J.J. Thomas rebounded a Southern Utah miss and passed the ball to Maxwell, who went the length of the floor and laid in a basket while getting fouled. The made free throw ballooned the CSUN lead to 18. Just before the end of the half, Parks drove baseline and found Maxwell under the basket for a thunderous two-hand throwdown which gave CSUN their biggest lead of the half. A buzzer-beating jumper by Kennedy made the halftime score 45-28 in favor of the Matadors. CSUN continued their impressive performance right from the start of the second half with three offensive rebounds in one possession and a putback layup by sophomore forward/center Tre Hale-Edmerson, giving the Matadors a 19-point lead with 18:31 left in the game. Southern Utah was not able to get any closer than 17 points, and Northridge eventually built up a 32-point lead when Hicks converted a layup off a halfcourt lob pass from sophomore guard Landon Drew. The Thunderbirds only shot 36.4 percent for the game compared to 50 percent for the Matadors. Head coach Reggie Theus felt Southern Utah’s poor shooting was a result of his team’s defense. “Tonight, I thought they executed our game plan pretty well defensively, which I thought caused (Southern Utah) problems,” Theus said. Northridge also dominated the game on the boards, out-rebounding Southern Utah 48-26. CSUN also won the paint battle, 44-26. After a loss to the Fresno State Bulldogs in November, Theus said his team needed to be tougher and get to more loose balls. He felt they did that against the Thunderbirds, but still have room for improvement. The Matadors will host the Seattle University Redhawks for a home game Thursday night at the Matadome.